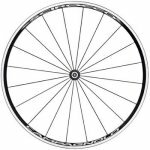 The Campagnolo Scirocco Clincher comes in black and silver wheelsets with an excellent price/performance ratio that offers the performance of the G3 spoke system used for Campagnolo's medium-profile wheels. You get all the technical benefits of top-of-the-range wheels at a slightly higher but still competitive weight. Rims have a 24 mm profile combine with oversize hubs with top-class spoking: spokes with a variable section and aerodynamic profile, radial on the front wheels and G3 on the rear ones. Featuring: Weights: 790g front, 1040g rear, Dynamic balancing, Aluminium hub bodies, Sealed industrial bearings, Variable section stainless steel aero spokes, Machined sides, G3 geometry (rear), Locking with light-alloy lever housing and Symmetric Action, light-alloy lever, Monolithic FW body.